CD review: "Taking It All In"
During the 1970s, when KiFM's "Lights Out Jazz" was all the rage, San Diego got stuck with the bum rap of being home to "Jacuzzi Jazz"  instrumental music that was more easy listening than jazz. If artists like Bob James, Kenny G and Hiroshima found annual gigs at Humphrey's By the Bay playing their modern version of what Herb Alpert had done a generation before, there was also an authentic semi-tropical jazz brewing on San Diego's beaches. It was as bright, accessible and breezy as anything the above artists played, but was more in the lineage of Stan Getz than Martin Denny. This San Diego branch of jazz was the real thing  featuring full-on improvised solos, instrumental playing of the highest order, and songs with real meat to them. Peter Sprague was right in the midst of all this fun music  and remains there today, with his latest release, "Taking It All In." 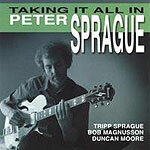 Surrounded by his brother Tripp on reeds, and close friends and regular collaborators Bob Magnusson and Duncan Moore on bass and drums, respectively, the new album is full of the acoustic, Brazilian- and Latin-inflected "beach jazz" Sprague has celebrated for the past thirty years. Throughout the nine originals and one cover (Pat Metheny's "Travels"), the band has the kind of loose interplay coupled to solid groove that only comes with longtime familiarity. Tripp's flute provides a gorgeous counterpart to Peter's guitar, while Magnusson and Moore create a fluid backdrop for them. All in all, another wonderful outing from Sprague and Co.